Established by Luis and María del Carmen Codosero in 1973, L. Codosero: Galeria de Arte Antiguo is based in the prestigious Salamanca district, the heart of Madrid's art market. The gallery's current location has been its headquarters since 1984. Specializing in sculpture and decorative arts from the Middle Ages through the Baroque, the Codosero family has become one of the most well known dealers of ceramics in Spain and throughout Europe. 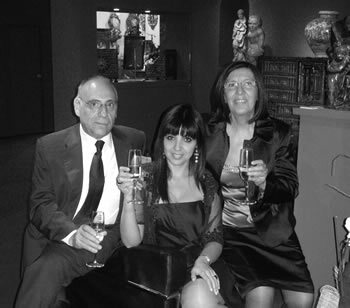 In 2002, their daughter, Laura Codosero, joined the business after completing her studies in Art History and courses at the Sotheby's Institute in New York City. Continuing her parents' tradition of excellence and professionalism, Laura brought with her a fresh perspective and implemented many innovative business models, including branching out to clients in the United States. Her transition from daughter to business partner was seamless, as she shares her parents' deep passion and respect for the objects they both sell and collect. Since the founding of the gallery, the Codoseros have dedicated themselves to the art of connoisseurship, fully appreciating the authenticity and beauty of the objects that they offer. It is often said that antiquarians are born with a clinical eye and an innate ability to determine the authenticity of works of art. However, this is not a hard and fast truth. For the Codoseros, research and investigation have become their most valuables tools, which they believe no reputable dealer should be without. As a result, dossiers containing detailed histories always accompany their objects. Since 1973, the gallery has established strong ties with their private clients as well as the museums whose collections they have helped to enrich and grow. Their connections with art institutions are widespread in both Europe and the United States, as they maintain relationships with institutions such as the Musée de Cluny in Paris, the Casa Natal de Cervantes in Spain, The Hispanic Society of America & Los Angeles County Museum of Art (LACMA) in the United States, and the Colección Patricia Phelps de Cisneros in Caracas and New York. In addition to being members of the Syndicat National des Antiquaires (SNA) (www.sna-france.com) and the Confédération Internationale des Négociants en Oeuvres d'Art (CINOA) (www.cinoa.org), the Codoseros are also founding members of La Asociación de Anticuarios de Madrid. The gallery participates in several international art fairs every year, including the Feria de Arte y Antigüedades de Madrid (FERIARTE) - of which they are also founders – Antiquaris Barcelona - where they were the featured invited gallery in 2009 – Le Salon du Collectionneur de Paris, the American International Fine Art Fair of Palm Beach, and the UNICA Fine Art Expo in Modena, Italy.